Finally We Get iPad Mini Retina Release Date! 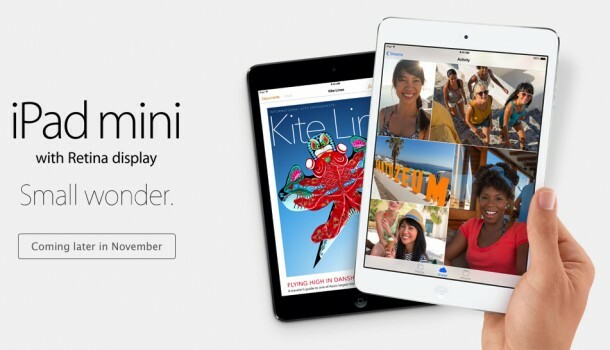 Finally We Get the iPad Mini with Retina Display Release Date – Bingo! Apple’s full-sized, lightest ever tablet aptly named iPad Air is about to hit U.S. stores – in a day. Although Apple had announced its iPad Air and iPad Mini 2 with Retina Display at the same time, Apple hasn’t yet announced about iPad Mini Retina release date. Promoting it as the beautiful, compact and smaller tablet, Apple is going to reveal iPad Mini with Retina sometime later in November. But when exactly, we do not know yet. However, it looks like someone other than Apple does know! 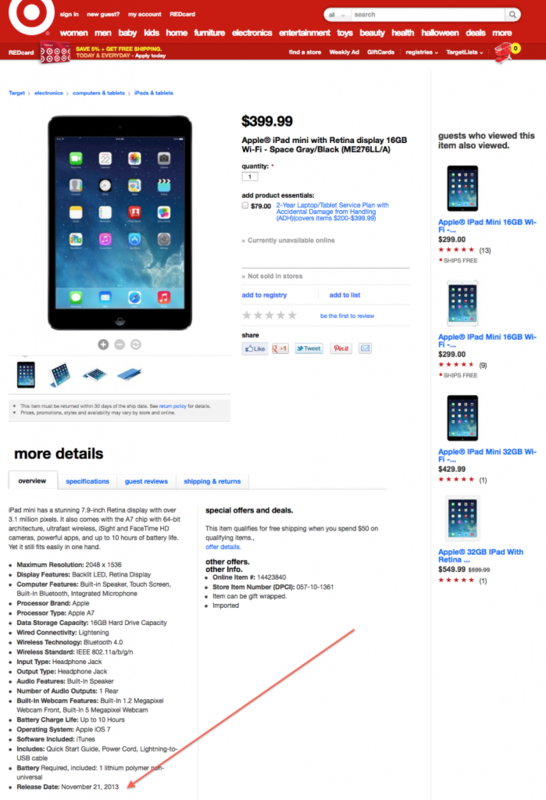 U.S. store Target is showing a November 21st as iPad Mini Retina release date. It is not certain though if the retailer has been informed about the launch date by Apple itself or it is simply trying to make some educated guess. Expectantly, Apple will try to release the new Mini 2 with Retina display sometime before the Black Friday on November 29th. It is when the Americans go shopping-crazy making companies earn profits for the entire year! Also, it has been heard that supplies of the iPad Mini Retina are ridiculously tight. Compare that to Apple iPad Air, the supplies are said to be plentiful. Perhaps it is the reason behind releasing iPad Air [read: iPad Air reviews from the bigwigs!] well before the launch of iPad Mini Retina. It can also be due to a $100 difference of prices in two products with pretty much same features and of course the difference in size. Apple’s iPad Mini will sport a very portable design paired with the beautiful Retina display this year. The device will be starting from $399 for 16GB, and would prove to be a good tablet for note taking and as a travelling companion. In the image below you can see the November 21st, 2013 as the release date for Apple iPad Mini with Retina display taken from the website of Target.